I was talking to a breeder this weekend about a former customer of hers. She sold her customer some nice stock and the new breeder has been working with it, getting ready to show for the first time. She’s been working for two years and hasn’t attended her first show! She’s waiting for her rabbits to get good enough to show. Yikes! She is missing out on so much by waiting until she thinks she has it right to even start going to shows. Besides all of the fun and fellowship with other breeders, she’s missing opportunities for comments on her rabbits and opportunities to see good (and poor) examples of the breed. In my opinion, she needs to jump in. I think she’d progress much faster that way. It may seem obvious to most of us that this new breeder doesn’t need to wait until her rabbits are competitive before attending shows, but many breeders use just that same logic about Convention and Nationals. I’m going to go when my rabbits are competitive. I’ve heard it from a number of people. Inside, I always say, no, no, no, don’t wait. And then I try to encourage them to go much sooner than that. When I planned to go to my first Convention, I had absolutely nothing that was competitive. I entered a couple of rabbits just so I’d feel like I was participating. I did end up purchasing Dandy, who placed 4th, so I had something competitive to show, but that wasn’t really necessary for my trip to be worthwhile. First of all, you get to meet breeders from all over. It is great to put faces with names you’ve only read about before that time. And I’ve met some great people that I’d never heard of before. You get to see really good Hollands. At shows, you might see one or two really good examples in each class – and sometimes none. How about seeing 40 or 50 to-die-for senior bucks all at once? 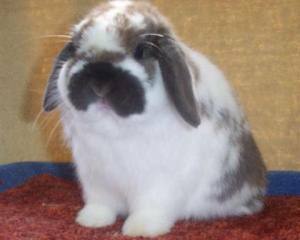 You really can refine your ideas of what a Holland lop should and can be and when you see that many quality animals at once. You realize that there’s not that big of a gap between what you have and what some of the more famous breeders have to show. When I first started, I felt like I had decades to go before I could compete. Going to national shows made things seem so reachable, especially once my own rabbits started placing in the top tens. Now I just think getting a special at Convention is decades off! At Convention, you also have a chance to participate in the annual meeting. It’s great to have a chance to hear first-hand what’s going on. If you are into sightseeing, there are opportunities to go out and see the area. Or, you can stay in and shop vendors until you drop. Plus, there are the new varieties and breeds to look at. And if you are into buying and selling rabbits, it doesn’t get any better than Convention for that. Providence, Rhode Island, is where I picked up Camelot’s Merlin (a presale). You know what a difference he has made to my herd. I always enjoy the HLRSC banquet, even if the food is barely adequate. We generally have a nice auction. And it’s wonderful to see all of the winners line up. Unlike regular shows, at Convention, you actually get to find out who won what. So you see, you could go to Convention and not even show rabbits – and have a great time. I have a friend who frequently does that and another who had a great time at Nationals without showing rabbits. But if you show and your rabbit does better than you thought it would, then that’s the gravy on your mashed potatoes. You never know exactly how Convention will go. There are sure to be some snafus and troublesome spots. The only thing I can guarantee is that you’ll be tired at the end of the week. But so far, I’ve always learned a lot, enjoyed the fellowship, and found it all to be really worthwhile.